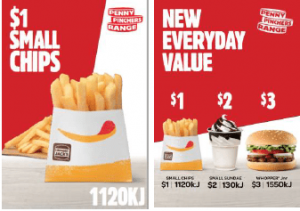 Hungry Jacks is now back with their $1 Fries. Great for those after school runs. Your hungry kids will thank you for it. However, they used to offer the $1 fries for the medium size. Perhaps demand was so large that they weren’t profiting well from the campaign. Either way, this is a good purchase to feed fussy eaters. Crunchy on the outside and soft on the inside, perfect for kids. We haven’t tried this one yet, but when we saw the ad, we got very excited. Hot dog crust! Because who wouldn’t want a frankfurt kneaded into their pizza dough. Personally I would have preferred bacon strips, but whatever is cheapest for Dominos. Can’t wait to order a meat pizza with this crust. It’ll be meat on meat. 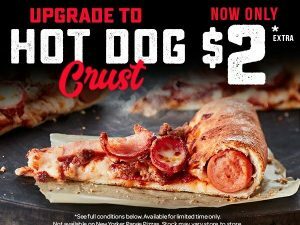 Hungry Jacks is getting better with their menu offers. For $6, you can get yourself a small whopper jnr meal. Bargain. Get it in store now. And they’re back! Get ready to line up to tackle these chicken pieces. Everytime we head down to our local KFC store on a Tuesday afternoon, you can bet all the mums and dads are waiting in line. These chicken pieces are not only tender, but they feed even the pickiest of eaters. Go Now! And we have the Big Mac’s Daddy, the Grand Mac. McDonald’s really trying hard to up their sales. With so many fast food competition, who cares about the Big Mac anymore. But perhaps a supersized one might tickle your interest. $3 off! I’ll give it a go.